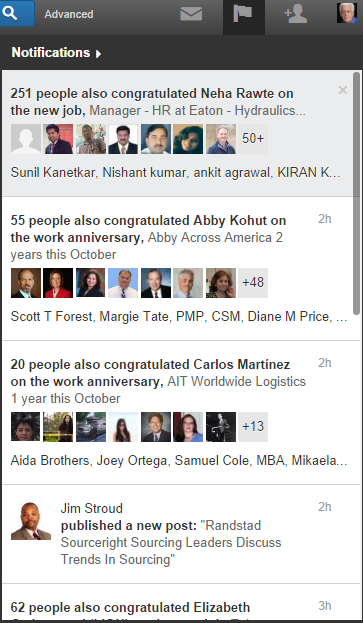 Are you paying attention to LinkedIn’s notifications feature? What is it you ask? 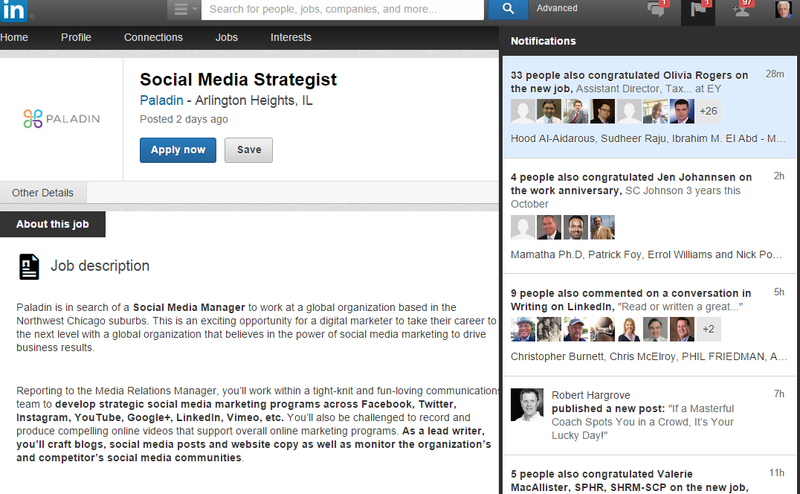 It is that little flag in the upper right hand corner of your profile above the LinkedIn tool bar. When you wish one of your connections a congratulations about a new job or wish them happy birthday LinkedIn stores that info. Then when someone else congratulates them or wishes them happy birthday you are notified as well. After receiving 15 or 20 other notifications from other well-wishers the notifications become tiresome. What do you do to remove the unwanted notifications? Your first step is to hover over the flag until the notifications dropdown appears, then you scroll down to the notification(s) you want to remove. Hover your mouse over the top right corner where the time on notification appears. When you do that an (X) will show up. Click on the (X) and delete the notification. LinkedIn will then ask you to confirm if you want to unsubscribe from the notification. They will give you two choices UNSUBSCRIBE or CANCEL. Click on unsubscribe and you will no longer receive that particular notification again. Here is my call to action. If you would like continuing information about Social Selling and LinkedIn I’m always happy to connect with people who PERSONALIZE their request. My email address is BruceBix49@gmail.com. 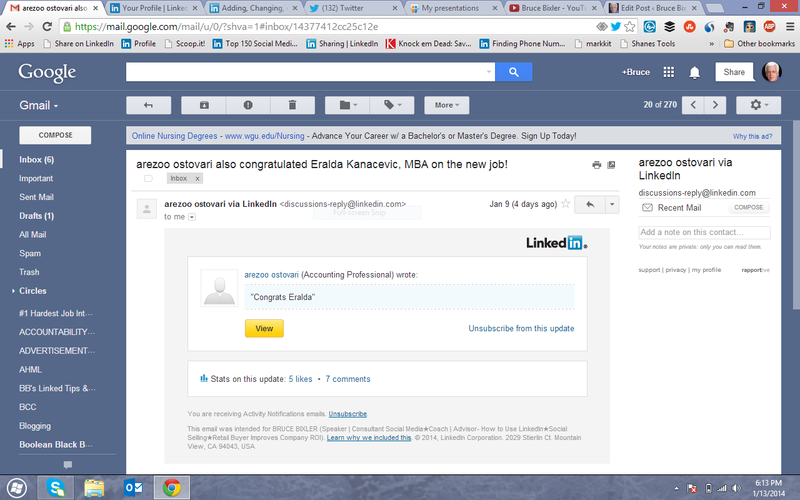 If you find this information valuable please pass this on to others who need help with LinkedIn. 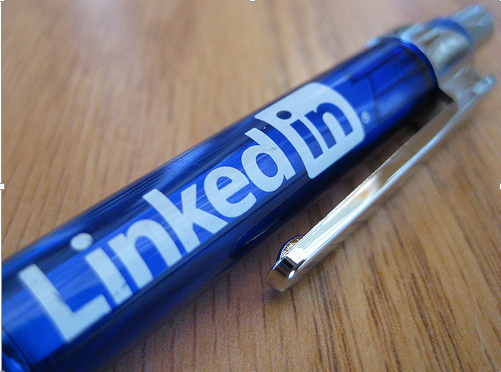 Those Annoying LinkedIn Notifications – Get Rid of Them! You know those notifications you get every time someone you wished Happy Birthday to another connection follows up and also wishes them a happy birthday. Well I finally found a way to get rid of them. 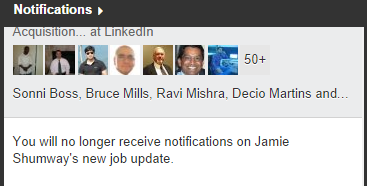 At the toolbar on the top right of your LinkedIn profile is a FLAG that lets you know of a new notification. Click on the flag and there is a dropdown of all the people you have congratulated, wished happy birthday to, or someone published on new post on LinkedIn. Some of the notifications I have will show 50 or 60 other congratulations. Hover your mouse over the offending notification. On the top right of the note there is a time of the last update. Move your cursor over the time stamp in the upper right hand corner and it will turn into and “X”. Click on the “X” a pop up will appear asking you to confirm that you want to unsubscribe or cancel it. Click on the blue unsubscribe and the notification will no longer appear on your profile. Then you will receive a message that you will no longer receive updates regarding that particular update. YEAH!! How to Unsubscribe from Activity Notifications Emails. With all the activity coming from LinkedIn and your contacts list, this will lead to a few, several, and sometimes many emails. Quickly delete inappropriate discussions and comments. See recent job postings and promotions in the group. You can choose to can change your email notifications on the Privacy & Settings page. You may be prompted to sign in to your account to get to your settings. Click the Communications side tab next to the envelope icon near the left side of the page. Click the Set the frequency of emails link to select the emails you’d like to receive and how often you’d like them delivered. But with activity notification emails you get for wishing someone a happy birthday, congratulating a connection on a new job, or moving to a new location you cannot use your LinkedIn settings. You have to go to your actual email, open it up and unsubscribe from the conversation. I’m always happy to connect on LinkedIn with people who read my blog. My email address is BruceBix49@gmail.com. If you find this info valuable please pass this on to others who need help. I write practically perfect LinkedIn profiles and exemplary executive resumes. Contact me at 224-221-9700 or Email me at BruceBix49@gmail.com.